Move over, store-bought tubs of hummus! 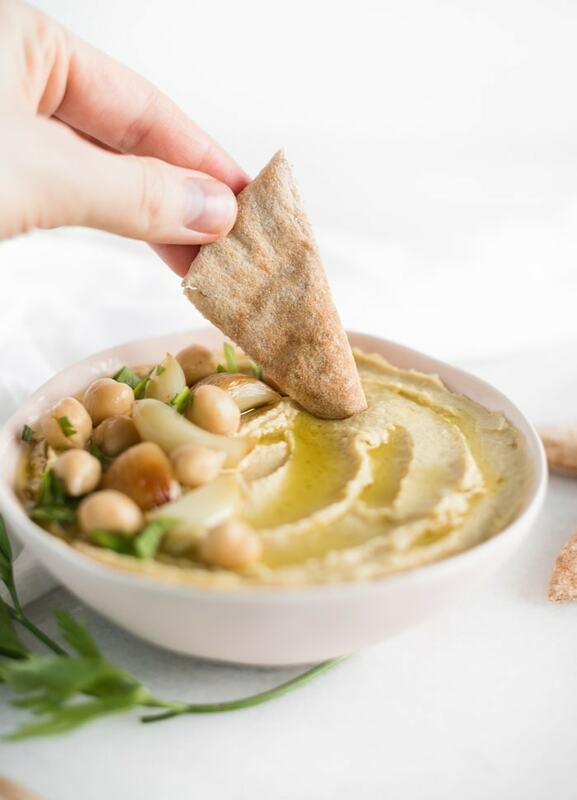 This homemade roasted garlic hummus is here and ready to take over. I’ve been loving hummus lately. 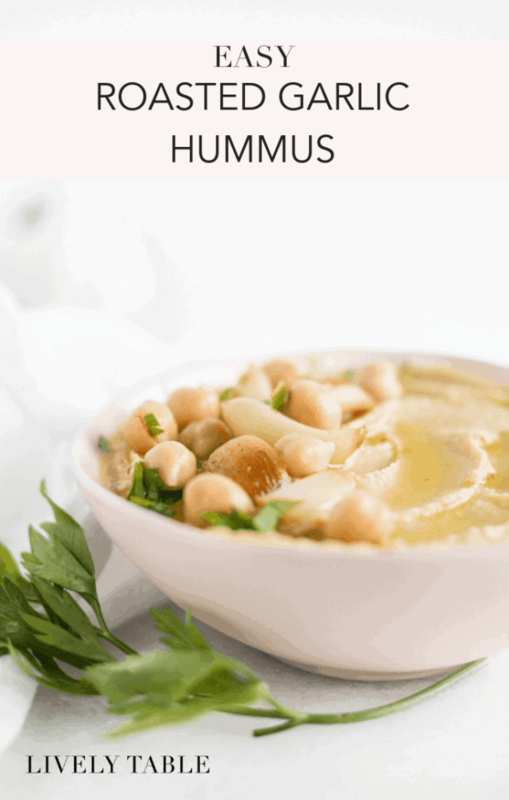 It makes an easy snack with fresh veggies or pita wedges that keeps me full and satisfied. I also use it all the time in other recipes, like Greek Power Bowls and Greek 7 Layer Dip. Even Mr. Table loves it. I’ve never really been inclined to buy pre-made hummus much because it is just so darn easy to make at home. All you do is blend up all of your ingredients in a food processor (I use my NutriBullet) and you’ve got a delicious batch of hummus ready to go! And you can control everything that goes in it and adjust for your taste preferences. Because I love garlic so much, I almost always make a garlic version when I make hummus. 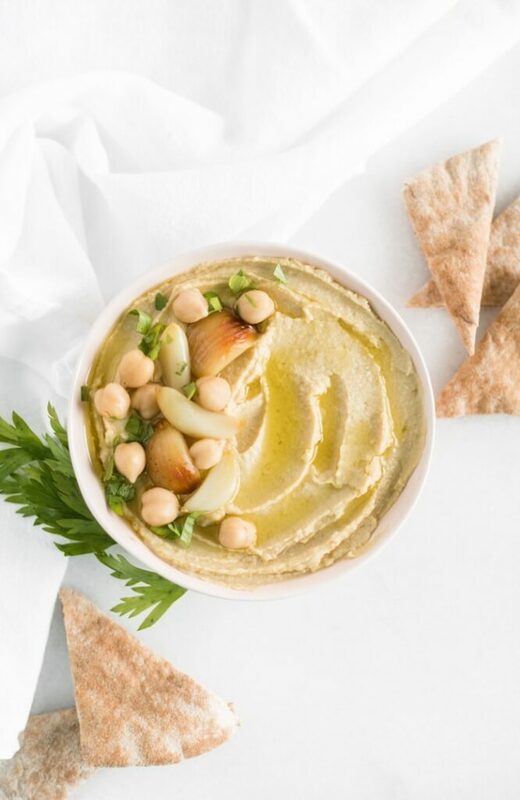 I know some people who aren’t accustomed to consuming as much of the good stuff as me may not want to go with raw garlic in their hummus, so roasted garlic is the perfect way to flavor your homemade hummus. Roasting the garlic brings out a smooth, caramelized flavor that is much less sharp than raw garlic. 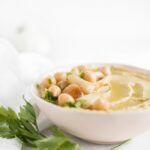 It makes this roasted garlic hummus taste incredible! 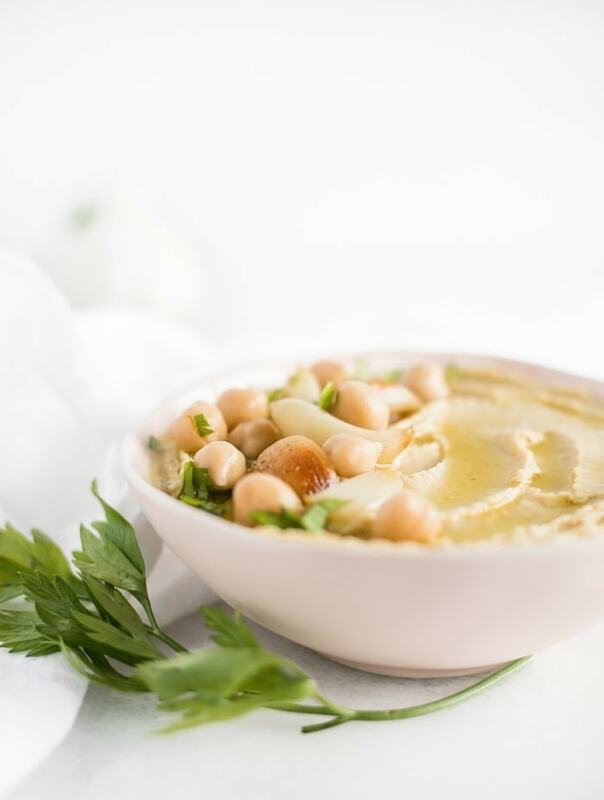 If you’re new to making homemade hummus, this roasted garlic hummus is a great place to start. You won’t go back to buying store-bought hummus again! Preheat oven to 400° F. Cut the very top off of the bulb of garlic (about 1/4 inch) until just the very tips of the garlic cloves are exposed. Drizzle with 1/2 tsp olive oil and wrap in foil. Bake 30 minutes or until garlic is soft and lightly browned. Remove from oven and unwrap garlic. Let cool. Squeeze garlic cloves out of skin into a food processor or blender. Add remaining ingredients and blend until smooth. You may need to add more water to get a smooth consistency. Serve with crudités or pita bread.